Thank you for accessing this website. I suspect you have found it as you are interested in quilts, midwifery, research or even my other work. For whatever reason I hope you find this project of interest and will engage with me about it. As a midwife educator I undertook a study around ‘The essence of the art of a midwife: holistic, multidimensional meanings and experiences explored through creative inquiry’. The full thesis is available online here http://eprints.uwe.ac.uk/16560/ if you wish to see it and the abstract is available below. However the purpose of these web pages is to provide more information around the textile quilt that I created during the research. As a qualitative researcher I wrote a personal reflexive diary. Following discussion of the project with others on the same programme I then decided to create the quilt with each entry of the diary represented by a patchwork square. Having taken the quilt ‘on tour’ to various events a question that was always asked has been: ‘what do each of the squares mean?’. This web site answers this question with the diary entries now presented with the squares. To find them please access the quilt tab above and then click on each of the squares. You will note as you read that this was a very personal and spiritual journey. I would be pleased with any discussion and comments around the content and look forward to engaging with you. However Iwill reserve the rightis work. I could not have done this without him! to not publish comments if I deem them to be inappropriate. In order to place this project online I am indebted to George Upson (soon to be BA (Hons) Media Production) who has been funded by Bournemouth University Undergraduate Research Assistantship to undertake this work. I could not have done this without him! In the United Kingdom midwives have a key role in caring for women and their families throughout the childbirth continuum. Midwifery is assumed by many to be both an ‘art’ and a ‘science’. The term ‘midwife’ comes from an Old English phrase ‘with woman’ with an expectation of holistic or ‘whole person’ care. At the same time there is some concern that movement of midwifery training into higher education institutions has led to an erosion of the skills associated with the art of midwifery due in part to students not being taught in an holistic way, with more focus on the need for academic achievement combined with a greater emphasis on the ‘science’ of midwifery. Little research exists that addresses what being a midwife means to those who have this role, or their view of the art of midwifery. This study aims to explore these issues with a group of nine women who are midwives, who had been part of an educational session that used creative methods to facilitate learning about the art of midwifery. Within the study the midwives are recognised as ‘whole’ people, with physical, emotional, spiritual and social aspects of themselves. Their views and experiences are explored in a qualitative ‘organic’ way utilising the concept of ‘bricolage’ and use of creative methods in order to address the multi-dimensional nature of the person . Material for the study was obtained through collection of written personal histories and created pieces used in the educational setting, semi-structured interview and photo-elicitation montages. Individual text ‘quilts’ have been created from the participants’ expressions that provide a visual representation of meaning. This has enabled a different, more ‘playful’ multi-dimensional approach to the material. 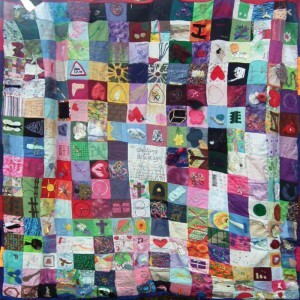 Further, in recognition of the author also as woman/midwife/educator/researcher, an autoethnographic approach has been taken, using a reflexive research diary, with a textile quilt created from abstract squares made as a response to individual diary entries. All these aspects have been integrated in the bricolage of the thesis. The thesis demonstrates how the use of creative methods facilitates a more ‘rounded’ approach to qualitative research. The participants identify complex meanings to being a midwife, related to their identity; ‘who’ they are in opposition to ‘what’ they are. This is balanced with choices made in relation to family commitments. The essence of a midwife is valued as important for what it is as well as for its impact. These meanings relate to the physical, emotional, spiritual and social nature of the role. In addition they view the art of midwifery to be grounded in a natural approach to the woman and her unborn baby, often in an increasingly technological environment. Birth is viewed as a significant event. Community practice is viewed as the ideal environment for providing midwifery ‘art’ and they highlight the need for intense trusting relationships with women and recognition of intuitive knowledge in their practice. This is balanced with views about safety and reflections on complex, often distressing situations that are faced in everyday practice. Being a midwife involves powerful emotions, for which they require greater support. They further raise issues of lack of time, some conflict in relationships between midwives, lying about their practice and effects of the ageing process on their role.